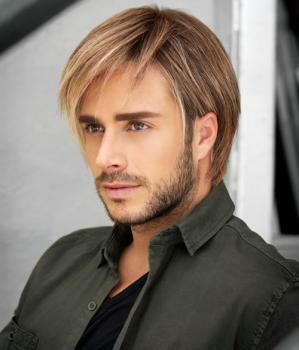 Chiseled - Him Collection by HAIRUWEAR - This cut has free-flowing, longer lengths on top with loosely textured sides and back. All over, piecey, razor cut lengths are long enough to tuck behind the ears for a sleek look. The lace front was made specifically for HIM and creates the ultimate hairline that can be styled forward or back. This style got its name for its casual look and tough attitude. Confident Fit Cap® Offering the latest in unique, state-of-the-art wig construction, the Confident Fit Cap is the ultimate in light comfort and dependable fit. The wide stretch lace used in most of today’s wigs is replaced with a thinner, more resilient stretch material that actually molds to the shape of the head for a lighter, more secure fit. The result is a cap that feels so natural and comfortable, you’ll think it was custom made.